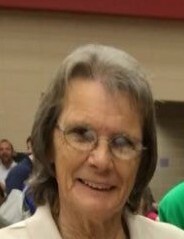 Lois Wade Bush, 71, of Albany, GA died April 13, 2019 at her daughter’s residence. Funeral services will be held Thursday, April 18, 2019 at 11:00 a.m. at Mathews Funeral Home. Rev. Mark Knight will officiate. Interment will follow in Crown Hill Cemetery. Active pallbearers will be Randall Bush, Brian Myler, Billy Myler, Riley Bush, Tracy Wade and Thomas Wade. A native of Colquitt, GA, she was born to the late Thomas and Zola Wade. Mrs. Bush moved to Albany, GA in 1961 and married her late husband, Dock Bush in 1968. She was employed with RCM Enterprises for 35 years. Mrs. Bush was a former member of Highland Park Baptist Church, she loved her Braves and spoiling her grandchildren. She was preceded in death by her siblings, Travis Eugene Wade and Jessie Cloud. Survivors include her children, Randy (Taura) Bush of Albany, GA, her daughter, Debra (John) Myler of Leesburg, GA, her step-daughters, Pam (Thomas) Wade of Baconton, GA and Brenda Webb of Villa Rica, GA, her brother, Thomas (Pam) Wade of Baconton, GA, four grandchildren, Randall (Lindsey) Bush, Brian Myler, Billy Myler and Riley Bush and two great-grandchildren, Silas Bush and Zoey Bush. The family will receive friends Wednesday from 7:00 PM until 9:00 PM at Mathews Funeral Home.